The Guinness Book of World-Records is an annually published book that tells about the numerous different records setting events, things, people, places. A dog name Mochi has just set one with a tongue-length measuring 7.31 inches long, Moshi has become the new world record. This dog slobber is definitely worse than her bark or bites it. Mochi, an 8-year-old St. Bernard in Sioux Falls, South Dakota, has a licker that measures a whopping 7.3 inches lip to edge. His giant tongue helped him lick his way to the Guinness Book of Records as the current holder of the "longest dog tongue" record. According to Carla Rickert, Mochi’s owner, in a video broadcast by Guinness: "When we opened the Guinness Book of Records and we see a mochi image there, we would be proud." 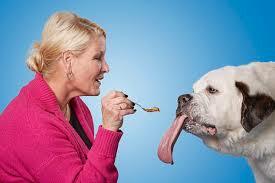 "This will make all the slobbers we have been cleaning for the last six and a half years deserve it." Rickert is not joking. Along with glory and fame, Mochi's long tongue brings challenges in the breathing, extra slobber when she is edgy, dirt, dust and leaves sticking to her tongue, according to the Guinness press release. Rickett and her husband Craig adopted Mochi when she was two years old. They expect the Guinness’s honor to inspire others to adopt rescue animals. She said: "Mo is strong, comical, loving, and always grateful and loyal to her eternal family." “This abused and neglected dog has taught us that it is alright to be different. We are proud of its unique features." According to Craig Glenday, editor-in-chief of the Guinness World Records, on announcing the new record title: "We are very pleased to welcome Mochi and record-breaking tongue to the Guinness world record family as part of our new publication" Amazing animals "Amazing animals is not your typical animals reference book. Rather, it takes a sideway look at our favorite pets and wild animals and is an opportunity for us to celebrate the barking mad of animal record-breaking. So, along with the classic faster, largest, and tallest record-holder, you'll find the most talented, most followed creatures and the most pampered creature on Earth. Mochi will have to have a tongue growth spurt of massive proportions to break them all the time record. That was previously held by Brandy, a boxer in St. Clair Shores, Michigan, Whose tongue was 17 inches before his death in September 2002. 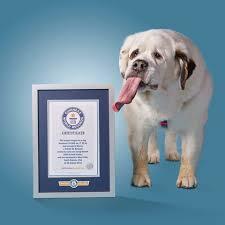 DoglopedixThe Guinness Book of World-Records is an annually published book that tells about the numerous different records setting events, things, people, places. A dog name Mochi has just set one with a tongue-length measuring 7.31 inches long, Moshi has become the new world record. This dog slobber is definitely worse than her bark or bites it.